Fiber Rush (shown on the right), is a man-made twisted paper material that looks and is actually woven all around the seat in method that takes it to the middle of seat. 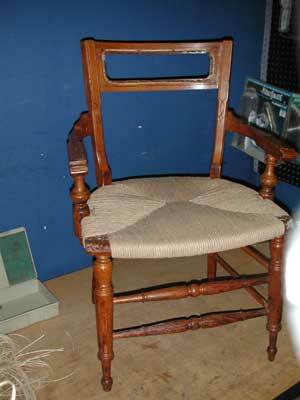 As a material it has a smooth texture,the bottom of the seat looks much like the top, although maybe not as neat. However fiber rush is much less expensive than genuine grass rush. Genuine Rush -is a natural hand-twisted material with same of weaving used as fibre rush.